If you have a tree that borders on being ancient, it may just die naturally. As trees age, they may lose branches, they may lose roots, and they may fail to produce foliage. In any case, it may be an indication that your tree is on its last limb. Ask a certified arborist to take a look at your tree to judge whether or not the tree can be saved, or whether it is a hazard. Fungi and pests can damage or completely kill trees. Fortunately, in many instances, a tree can be saved from complete destruction if fungus and pests are noticed in time. Keep a keen eye out for dead and dying limbs, as well as signs of pests and fungus (you may notice a lack of bark, small holes bored into the tree, and discoloration, among other signs). If you notice any of these indications, it’s time to have your tree checked out. You could save your tree from more serious damage. If your tree is poorly balanced, if it’s growing in poor soil, if it has weak roots, or if it has been blown over by the wind, your tree may fall over. That can be a major concern for your safety, as well as the safety of your home and property (or your neighbor’s!). If you notice that your tree is beginning to lean, you should take action immediately. In some instances, a tree may be cabled and tied down to reverse damage. In other cases, it may be best to remove the tree before it falls. Lightning strikes, high winds, snap colds, overexposure to sun, and other natural occurrences can damage your trees. With these unique instances, it is, once again, best to speak to a trained arborist. Your arborist will be able to assess the damage that has been done, and she will assess whether or not the tree can be saved. Sometimes a tree may just need to recover over time (e.g. if the tree has endured a cold snap). On the other hand, let’s say your tree trunk has been struck by lightning—you probably won’t be able to save the tree. 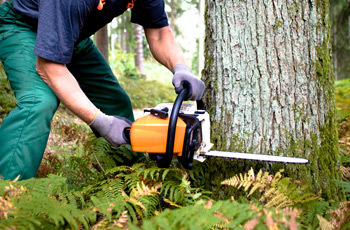 When your trees become a hazard, we’re here to help. We bring over a decade of experience to the table, and our team includes trained and certified arborists. We’re fully licensed and insured, and we strive to use the safest practices to provide the highest quality service to our customers. You can learn more about the Jack & Jill Tree Service Team, or get started with a free quote!